Did you ever see the wonderfully romantic Kennerton Green in Mittagong in the Southern Highlands of NSW? Its creator, Marylyn Abbott, has spent the past 20 years in a quiet corner of Hampshire applying her great style, enthusiasm and humour to the recreation of West Green House. Our Perth-based tour leader Colin Barlow was back there recently with a group of Ross Garden travellers, and they all loved Marylyn’s trademark big vision and great sense of fun. 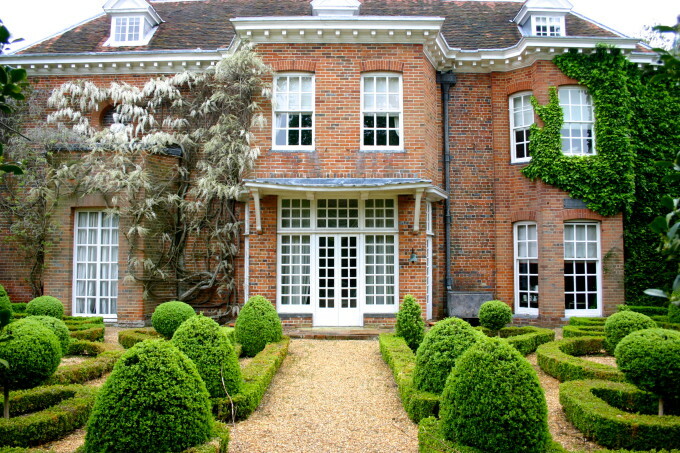 “Marylyn took on the restoration of West Green after an IRA bombing in 1990 destroyed the forecourt and seriously damaged the house. 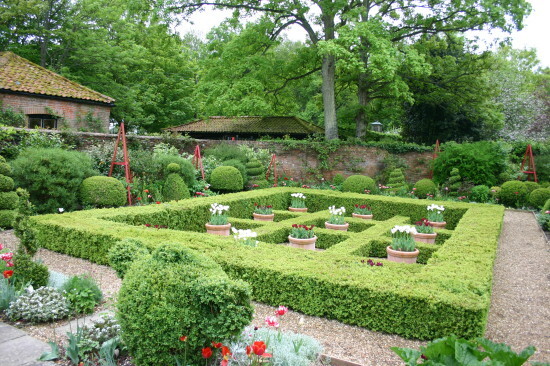 The National Trust repaired the exterior of the building but left the interior and the gardens to Marylyn, who, with typical passion and commitment, has created a wonderful garden. The garden journey takes you through a series of ‘rooms’ – all of which provide plenty of inspiration for your own garden, as well as lots of fun. It starts at the main gate with an ‘Alice in Wonderland’-themed garden filled with checkerboard parterre and topiary, including a Mad Hatter and a pot–smoking caterpillar! The red and white tulips which fill the pots in spring are replaced with either red and white roses, or with red pelargoniums and white daises during summer. The fun continues with a chicken house that’s more Chook Palace than coop and this platter of apple donuts! 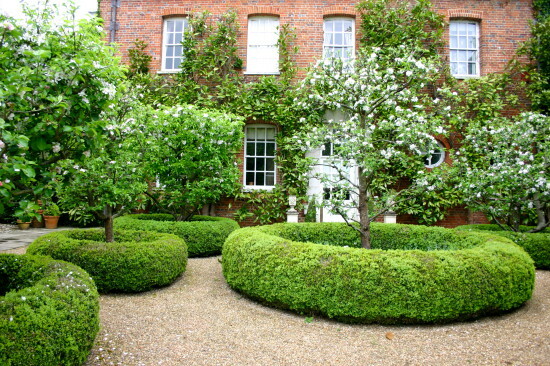 Donut-shaped parterres are planted with heritage apples, which were in beautiful bloom when we visited. 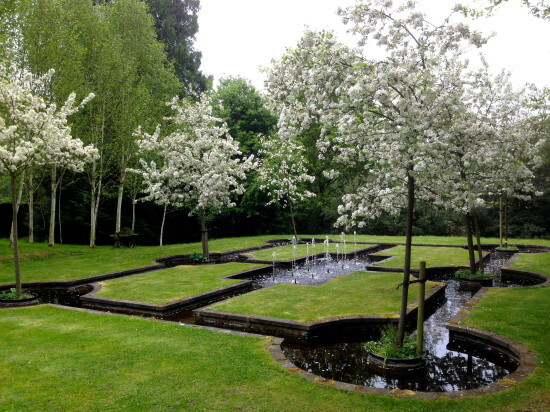 Water flows throughout the garden and is used in several ways. In the grandest of the water gardens, ‘The Nyphaeum’, a rill descends from a temple down water steps into ponds, before dividing again and leading to a moon gate in the garden wall. You can just make out the water here, looking like two silver ribbons on the sides of the stairs. Once the water reaches this point it is collected in holding tanks underneath the pavers and then recirculated back up to the top fountain. The Islamic-inspired ‘Paradise Courtyard’ was at its crescendo when we saw it, with the crab apple, Malus ‘Evereste’ in full bloom. Clouds of billowing blossom appeared to rise like bubbles from the water, echoing the bubbling water jets. The planting of the birch is clever isn’t it – with the white trunks accentuating the lightness of the whole effect. Marylyn has always believed that a kitchen garden should look as good as it tastes. She certainly achieves her goal in the West Green potager. There are circles of tulips enclosed within box, helping create a tapestry of texture and colour using vegetables, herbs and flowers. The combination of flower and vegetables helps pollination, but also looks a treat. Apples are espaliered over the arches – the horizontal growth increases fruit production. 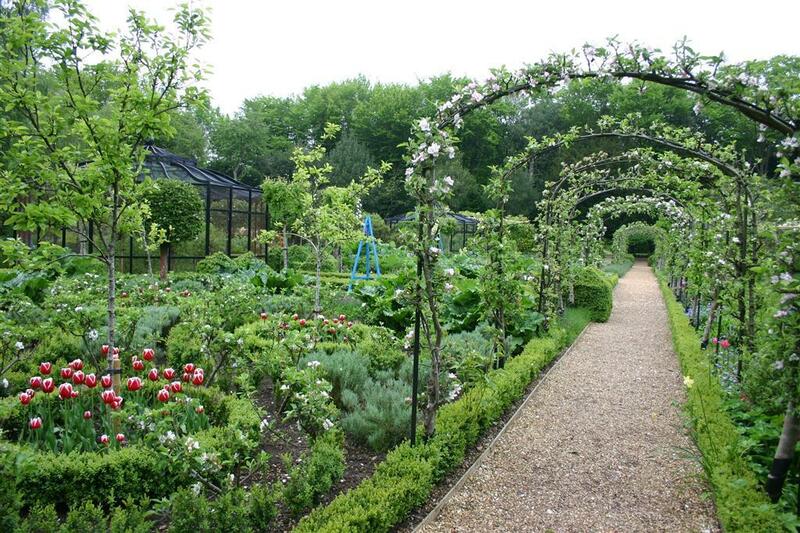 Our favourite part of the potager though, was probably the elegant fruit-cages. Can you make them out on the left of the picture here? They are the black structures that look a bit like aviaries. They are filled with berry fruits. This must surely be the most beautiful and practical way to avoid problems with fruit fly, rabbits, possums or any other marauders. 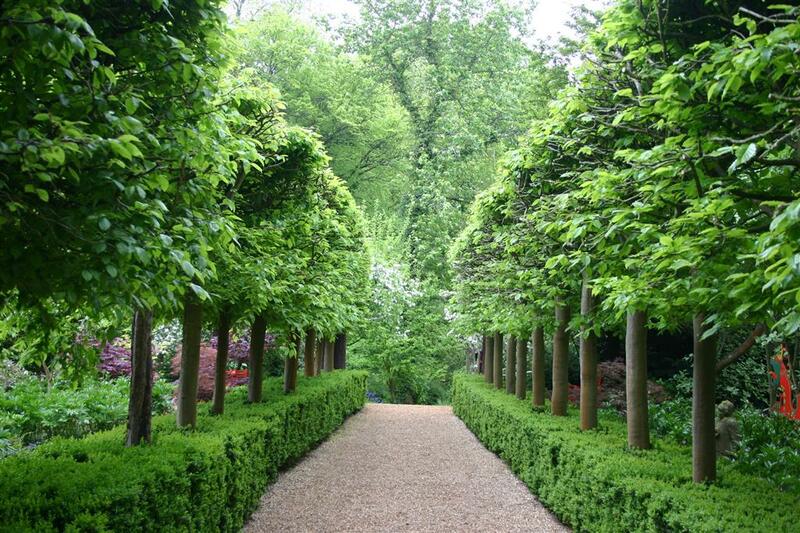 A simple but key element that caught my eye on my first visit to West Green House back in 2008 is the avenue of hornbeams and I was keen to see how they had matured. Beautifully! was the answer, as you can see. I’ve used this technique in designs for school and public gardens. Where I am in WA, ornamental pears, lilypillies, Magnolia grandiflora cultivars and crepe myrtle all work well for pleaching. Trusted low maintenance lower hedges include Buxus ‘Faulkner, Syzygium ‘Bush Christmas’, Duranta ‘Sheena’s Gold’ and Metrosideros cultivars. 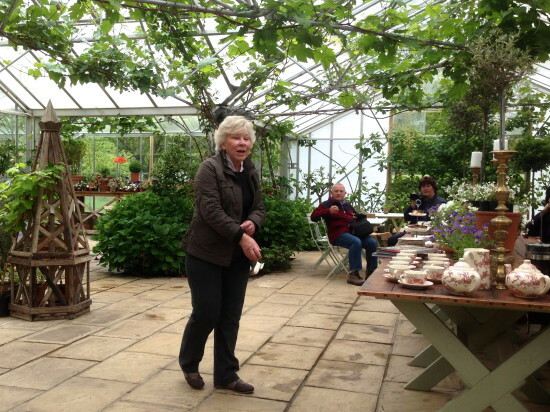 We had time to mull over the ideas in the garden when Marylyn served us morning tea in the glasshouse. Home-made scones with lashings of jam and cream, finger sandwiches, little patisserie, all on a three-tiered cake stand with tea in French toile-patterned china, and served with Marylyn’s effervescent charm! West Green House is part of two of our itineraries next year. See it on our Best Gardens of Europe tour when Colin takes a group from the heights of tulip time in Holland, through France’s great gardens, and on to England to close with Opening Day at the Chelsea Flower Show. 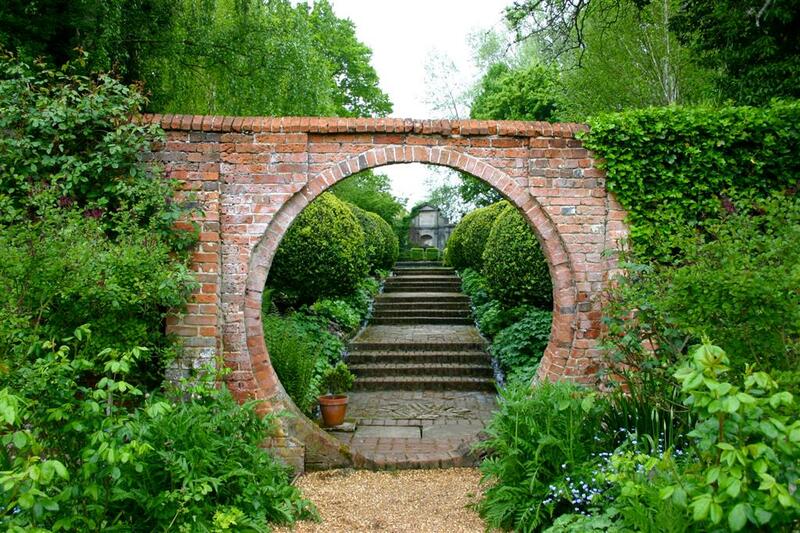 West Green is also part of our tour of Gardens of England and the Chelsea Flower Show, led by Linda Ross.